Shakhtar played a second away game in a row. This time the Pitmen - coming second in the premiership (45 points) - took on Zorya, currently holding the fifth spot in the league table (28 points). 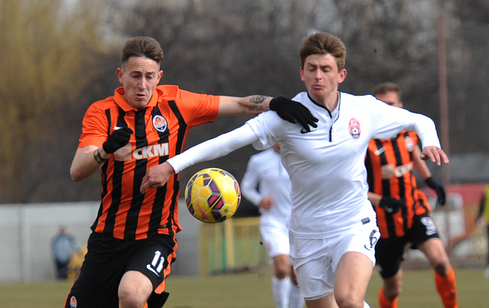 Their first round face-to-face encounter ended in a 2-0 win in favour of the Donetsk side. 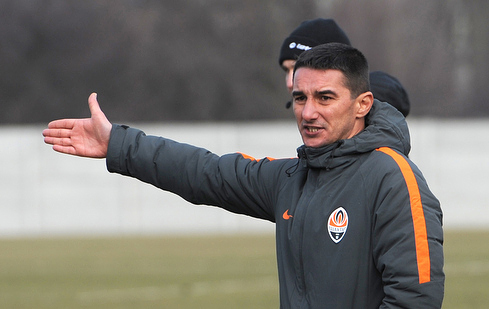 Valeriy Kryventsov did not make changes to the starting line-up, which defeated Volyn a week earlier (2-0). However, the Luhansk side were strengthened by three players from the first team: Levchenko, Yarmash and Kacavenda. In the opening stages of the game, Zorya tried to oppose the visitors head to head, however, the Pitmen took the game under their control in no time and mustered a few clear-cut opportunities inside the opening twenty minutes. Zinkevych burst clean through on goal but miskicked his shot well over the target. Shortly after that, Arendaruk fired his shot a few inches wide of the post from a lovely shooting position. Hlahola muscled his way on the right flank and nearly lobbed the ball into the far top corner before forcing a goalkeeper to reach out and save Zorya. Kiryukhantsev flicked his low cross inside the area for Hlushchuk, with Luhansk side defender beating him to it and denied the threat at the last moment. Valeriy Kryventsov’s team attempted to press highfield by blanketing the opponents even when losing possession, having registered a dozen of tackles at the other end of the pitch. Following one of them, Ihnatenko played in Hlahola on the right, with Levchenko managing to deny an effort by Shakhtar number ten. Yurii Hlushchuk came closest to scoring. First, following a piercing pass into the penalty area, he fired a one-touch drive only to see Zorya goalie parrying the ball away from danger. Then the forward of the Orange-and-Blacks forced his way through three defenders at a speed to have his piledriver blocked by the back. Zorya had the only sight of goal on the dying minutes after playing a set piece, but the defensive line of the Donetsk side managed to mop up the treat. After the interval, the Pitmen fashioned another two excellent opportunities to break the deadlock, but both Hlahola and Ihnatenko failed to dispatch their shots on target from nice shooting positions. Nearly throughout the entire second half, FC Shakhtar players operated on the opponents’ side of the field being constantly on the front foot, however, all their attacking moves lacked a nice finish. Again, Hlushchuk displayed a good performance, being definitely short of luck in this match: a crisp counter saw Yurii trying to tap Topalov’s left cross in from the edge of the goal-line, but he dragged wide. With a few minutes remaining, the entire Donetsk side, including centre-backs, charged forward and could have snatched a win after taking one of the corners, but Kacharaba sent his header wide of the post. Shakhtar and Zorya played a 0-0 draw to lock horns with one another again in the second part of the premiership. The Pitmen are expected to have their following fixture against Olimpik in Schaslyve on March 16. - Every new game points to the same problem - we do not have a goal machine. We forge ten scoring chances per game, but there is no player, which is able to convert them. This happened in the previous matches vs Vorskla and Volyn, and it has occurred today. I talked about this problem as far back as last summer, but I do not manage to find a suitable player for this position yet. In the course of the season, we were left without our top scorers Boriachuk and Adamenko, with us being not able to find a replacement for them yet. At the same time, we pay a lot of attention to finishing attacking moves in every training session: various shots, overlapping, rushing, delivering low and high crosses... We regularly polish all those elements, but as soon as we come to play a competitive game, we suffer again because of poor realization. In this clash, every football player in my team is above reproach. In terms of game organization, correct movements, compactness, willingness to emerge victorious in every single challenge, all the guys produced a brilliant performance. The only thing that we failed to do was scoring a goal. The gap between the top spot has increased, but as long as there are chances, we do not lose the hope of catching up and leaving the competitors behind. The team is eager to make it and ready to fight to a finish. However, in order to win, you need to score.